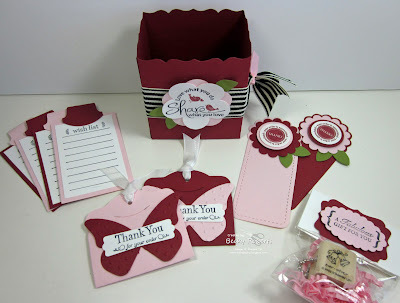 Everybody gets a little sampler of hostess thank you ideas with the Taking Care of Business Set now available on supply order for US Demonstrators. 7/20/11 Edited to Add: Before I left for convention, I called SU! to ask if this set is still available and was told it will be on supply order. I've had tons of e-mail from readers telling me it's not on there. I called again today and it WILL be on supply order by the end of the week and the order number is 115090. 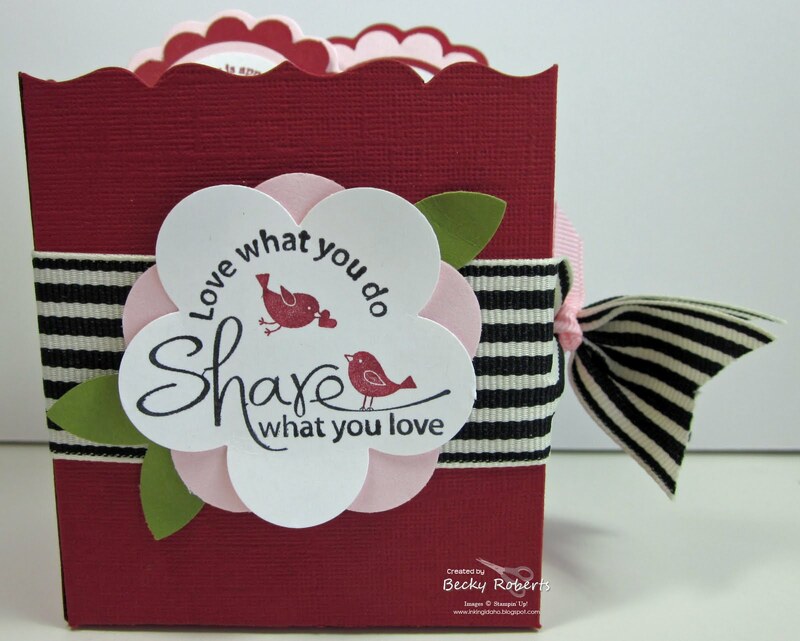 Round Tab Punch, Two Tags die-cut, Fancy Favor die-cut box, incentive stamps available on supply order, Pink Pirouette, Riding Hood Red cardstocks. I looked for this on the supply list and I did not see it? Me too. Couldn't find it. Sure is cute. I LOVE your ideas! The butterfly on the tag is awesome! Great job! Thanks for sharing! I can't find it either. Your samples are great. Becky what a great idea. I just recieved the "angel" stamp from my upline and was thinking of what to do with it!THANKS for the inspiration! Hugs. either. I love your ideas..
hey sweet thing! I see that the set in question was in the last catalog, but the image you used with the birds . . . where is that from?? Hi guys - I called SU! right before I posted this and they said it would be on supply order...but it is not there. I will be calling them Monday and will let you all know.